Is your connection not performing up to your expectations? Check out some of these time hacks below to find out how you can improve your broadband experience. The type of broadband connection recommended, whether it’s a Wired Connection or WiFi Connection depends on what you need it for. Although WiFi has brought us much convenience and improved significantly over the years with the introduction of new WiFi standards, it is still subject to much limitations and interference as compared to a Wired Connection. But, fret not, today’s WiFi technology is good enough in handling most of our online daily tasks but we recommend that you complement your WiFi Connection with a Wired Connection for the best broadband experience. Check out this table below so you can have a better idea in selecting the type of connection that befits your usage. Gives you a direct connection through an Ethernet cable with minimal interference. You are more likely to achieve subscribed broadband speeds on a wired connection. At least 2x slower than a wired connection. Your data is more secure with a physically secured connection. Hence, harder to intercept. Ideal usage Ideal for big file transfer, boosting streaming quality and online gaming. Recommended connection for speedtest. 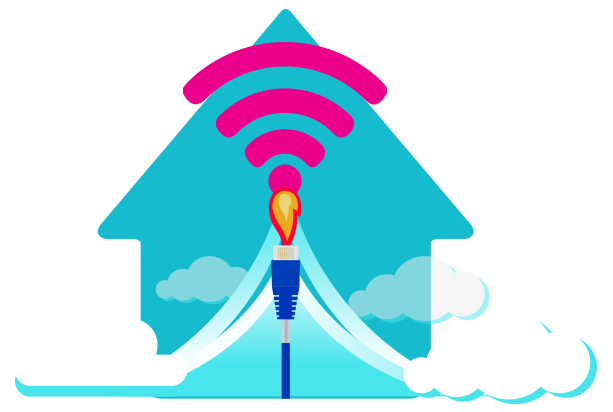 Connectivity for multiple WiFi enabled devices such as mobile phones, laptops and tablets. 1. Subject to various factors including interference, device capability, number of users on a network, Ethernet cable, etc. 2. What does latency mean? Latency is the amount of time / delay for data to travel from point A to point B. For example, if you’re on a high latency Internet connection, you may be experiencing delayed responses while playing online games or mid-sentence pauses while having a conversation on Skype. Advanced devices in the market are likely to achieve at least 90% of your subscribed speeds over a Wired Connection. But if you don’t, check your Ethernet cable. This cable connects your router to your computer or laptop to get a Wired Connection. They consist of different categories that communicate with different speeds and it is usually indicated on the sides of the cable. NOTE: Your Internet speed is only as fast as the speeds that you are subscribed to. If you are having problems with your connection, download our troubleshooting guide here. Think of your WiFi as waves broadcasted slightly downwards and weakens by distance. Get the best WiFi performance by going through this checklist when positioning your router. Most folks leave their routers running 24/7. If you do, this will eventually result in your router performance slowing down. Excessive usage causes your router to run out of memory and overheat, disrupting your connection. Restart your router when needed to improve its performance. Step 1: Switch it off and unplug from the socket. Step 3: Plug it back in and switch it on. Your WiFi connection could slow down if there are too many users on your network. Reduce the number of users on your network at any one time or change your WiFi password once every 3 months to prevent squatters from freeloading off your WiFi network. Your WiFi network can slow you down if you’re connected to a congested 2.4GHz frequency. Dual-band routers that we provide lets you choose between the 2.4GHz or 5GHz bands for the best WiFi experience. The 5GHz band is like having an alternate route on a congested expressway if you live in a highly populated residential area. Use the 5GHz band when you are closer to your router as it has a shorter broadcast range. Hook on to 2.4GHz band when you are further away from your router as it has a wider broadcast range. Whenever you upgrade your speeds, check if your router is compatible with those new speeds. If your existing router is incompatible, check out the new dual-band routers that we offer on Self Care at subsidised prices for our subscribers. You could even be eligible for a free router upgrade if you’ve been our subscriber for at least a year. Check out Self Care for more details. *Free router is subject to contract renewal. Your high speed Internet could be limited by your devices’ capability. Most devices in the market may not be well-equipped to keep up with advanced broadband speeds. Although devices come with published speeds surpassing your broadband speeds, bear in mind that these speeds are based on lab conditions with perfectly wired connections. In home conditions, speeds would vary most of the time, especially when you are connected through WiFi. For home scenarios, check out the speeds table here for a more accurate comparison. Tried all the WiFi Hacks and still pulling your hair out? Don’t fret cause we still have a trick or two up our sleeves. Take a look at how the WiFi Booster can improve your WiFi signal. If all else fails, contact our Support Ninjas at 1800 18 1818. We’re at your service 24/7. © Copyright TIME dotCom Bhd (413292-P). All rights reserved.